Sharing guinea pig (and some non-guinea pig) related links from the past month. Enjoy! Chicken. Bear. Pizzeria owner. Swiss yodeler. Boars Linus, Charlie, Sawyer, and Miles feature in some of the most creative piggy costumes I've ever seen. The detailed sets and props are such a complement to each theme. 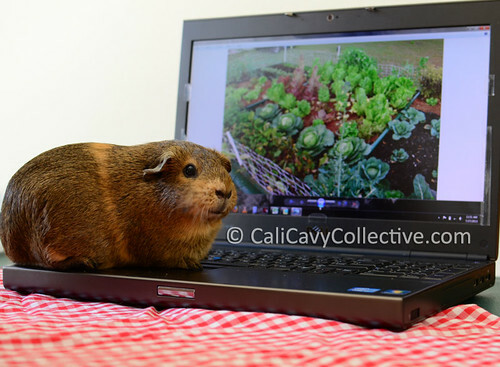 An article and video about OCCH's Socal Pignic on the Small Animal Channel. Wish I could have been there! Speaking of OCCH, have you checked out their Wheek Boutique Etsy shop yet? They offer piggy products such as cozies, cuddle cups, cage liners, lap pads, and the guinea pig cookie cutter I wrote about earlier this month. Proceeds go to support the rescue. I've been meaning to make this fresh summer salad. No doubt tomato loving Abby-Roo will be thrilled to take care of the unused cherry tomatoes. Planning on taking a road trip with your guineas? Bertie and Jenny share a few of their travel tips. This time-lapse photography video of Earth as seen from the ISS is entrancing. Footage featuring Anchorage and Norway are equally as captivating. Those costumes and setups are beyond cute. The pigs seem quite relaxed on all the sets, too. That salad looks delicious. I may have to try that.